Power providers, manufacturing companies, surface and marine fleet operators and millions of small business and home-owners have turned to natural gas to ensure they can get the energy they need, at a price they can afford. Here in the U.S., the companies that provide the electricity to light, heat and cool your home have turned to natural gas. It is America’s largest growing source of energy, offering a clean, reliable and affordable way to create power. In 2015, natural gas produced nearly one-third of U.S. electricity. 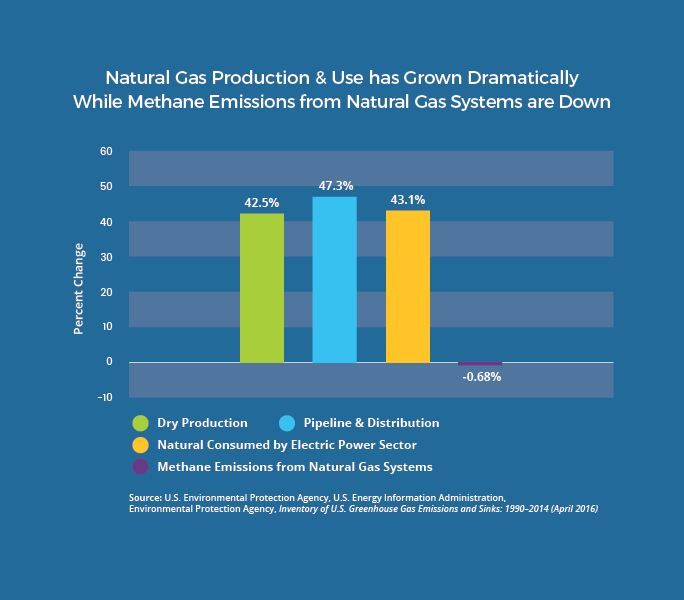 Natural gas is lowering greenhouse gas emissions and reducing air pollution. America has generations of natural gas we can access at affordable prices. When used to generate electricity, natural gas produces half the CO2 emissions of coal. In recent years, the use of natural gas by electricity-generating plants has increased greatly, and today power sector CO2 emission levels are at their lowest levels in nearly 30 years. The U.S. Energy Information Administration reported that switching to natural gas accounted for almost two-thirds of the CO2 emission reductions from 2006 to 2014. The environmental benefits associated with natural gas go well beyond CO2 reductions. Greater use of natural gas in power generation will also reduce NOx, SO2, PM, acid gasses, Hg and non-Hg heavy metal emissions. The U.S. depends on energy being available at the flip of a switch, 24 hours a day, 7 days a week. For that to happen, the supply and demand of electricity must always be in balance, meaning the energy going into the power grid must equal the amount being used. That’s why all our nation’s energy systems require constant power generation that can also fluctuate with our needs. Natural gas generation is doing just that: reliably and efficiently providing power at an affordable cost while being flexible and fast-ramping enough to keep the lights on when intermittent resources like wind and solar are not available, all while reducing its own emissions. More natural gas means affordable natural gas. And America has a lot of it. How much? According to the latest IHS study, 800 trillion cubic feet of natural gas can be developed for around $3 per cubic foot. Even more remarkable, there is nearly twice as much gas (1,400 trillion cubic feet) recoverable for just a dollar more. To put this amount in perspective, in 2015 the U.S. consumed only 27.5 trillion cubic feet of natural gas. Production of natural gas from shale regions across the country, along with investments in pipeline infrastructure, allows natural gas to meet the growing demand for clean, affordable electricity. Thanks to technology improvements in the natural gas industry, we can now access even more of our natural resource at affordable prices. This abundance and affordability is why natural gas accounts for more than half of all recent power plant capacity additions. Natural gas is a domestic, reliable and abundant energy resource, providing fuel for municipal and commercial truck fleets, marine vessels, drill rigs and other high-horsepower engines. As is the case with any American product, when free trade is allowed to flourish, our economy enjoys greater prosperity, our people greater economic benefits and our workers more and better jobs. Supporting the nation's ability to export natural gas is good for the United States economy. Natural Gas makes renewable energy possible.